Japanese women give chocolate to men on Valentines Day and receive double or triple their efforts back a month later on White Day. Gifts are not traditionally given on birthdays or Christmas but the infiltration of the Western world has prompted some Japanese people to participate. At weddings, births and funerals people give money in beautiful envelopes wrapped with intricate cord; also children get money on New Years day. Money is also the most common gift for a teacher…something that would not be appropriate for us! (Can you say ‘bribe’.) Money received at weddings, births and funerals is acknowledged/reciprocated by a gift sent by post a month or two afterwards. Presentation is everything and the wrapping is often more important than the gift itself. I’m pretty sure I was Japanese in my last life as I love wrapping presents. (I could also have been a caterer as I also excel at arranging food on plates.) I digress. If you’re ever presented with a gift from a Japanese person, be sure to accept it with both hands and express gratitude. Don’t open it in their presence as it’s considered rude, this also makes it easier to re-gift if you don’t ruin the packaging 😉 You now have an obligation towards that person …hence the beauty re-gifting. Which is great for non-perishables but doesn’t work so well for melons, meat or flowers. 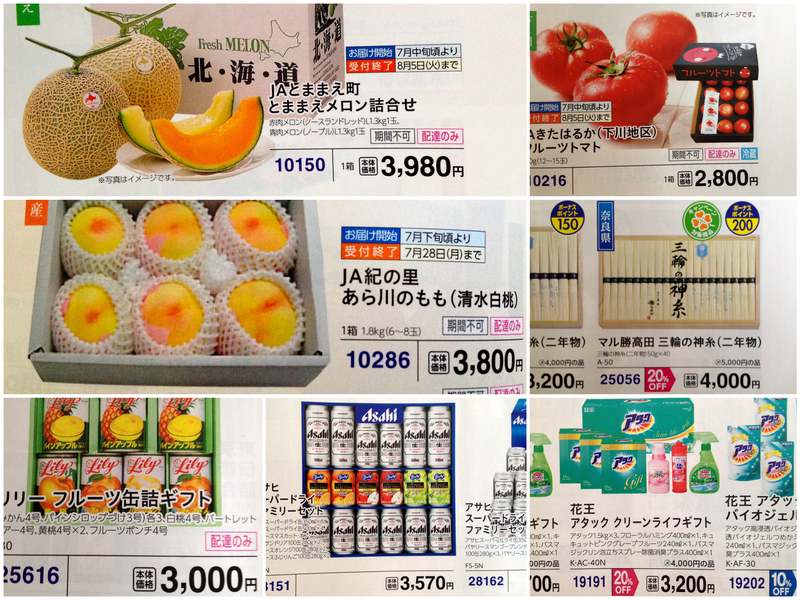 I just love the fact that you can get beautifully wrapped and nicely boxed canned goods, laundry soap, tomatoes, cans of beer, soba noodles…pretty much anything you can think of. This is so far beyond the typical North American gift of a nice box of chocolates, cookies or fancy tea that you really have to see it to believe it. Many department stores and supermarkets have entire departments dedicated to the choosing, ordering and delivery of gifts. Note that foreigners are not expected to understand or comply by the gift etiquette but if you plan on living here it might be an idea to learn…and bring a few bottles of maple syrup or maple butter (VERY popular) if you’re on your way over. Trash is complicated here. Burnables go out on Tuesday and Friday. Weird things that you wouldn’t really think of, are considered burnable. The agency leaves us helpful little signs so we know what’s what: food, old sandals, bento boxes, plastic bags, plastic bottles (yep) and used chopsticks. The recycling (separated by category) goes out on Wednesday morning: bottles and jars, hairspray aerosol cans, magazines and newspapers and tin cans. Unburnable things smaller than 30 cm go out on the first and third Wednesday and include: broken bowls and cups (even if they’re glass), batteries, light bulbs and lighters. Not sure what happens items bigger than 30cm but I suspect they go out on the garbage day that we all used to look forward to when I lived here as a bright young thing in the 90s. I think this was the day that people left out GREAT stuff that was barely used that we would scavenge. We got a TV. Seriously. The remote was nicely taped to the top. Not a junker either…I don’t think the model they disposed of was even available in Canada yet. Housing is expensive so most people rent therefore they have a fair amount of disposable income so they buy the latest greatest stuff. But that’s another story. We also got a rice cooker, a new futon in the package, dishes, a table, a bike and a chair. I saw a bread maker on the street last Wednesday so I suspect that is when you get rid of big stuff. Maybe we’re not allowed to or maybe they just assume we don’t have anything that big. The amount of packaging used is much less than it was in the 90s. Things used to be wrapped like crazy. For example, if I bought a bun from the bakery (one bun), it would be put on a small cardboard tray with a doily and a napkin, then into a small box, then into a carrier bag–sometimes with tissue paper. You could not sway them from this procedure and I even spoke Japanese then. When I moved into in the city (Gotanda, the armpit of Tokyo) there was another foreigner I would see at the supermarket who used to bring her own shopping bags (remember this was 1991) and the cashiers did not know what to make of her. They treated her carefully, like she was an unpredictable nut job that would potentially destroy the social order. In terms of recycling and package, there have been improvements twenty-three years later. I’ve noticed that the packaging is less, I even get bonus points on my supermarket card if I bring my own bags! However, there is still an awful lot of garbage and some changes will be a long time coming: they still offer plastic umbrella bags at every store which you are expected to use when it rains. 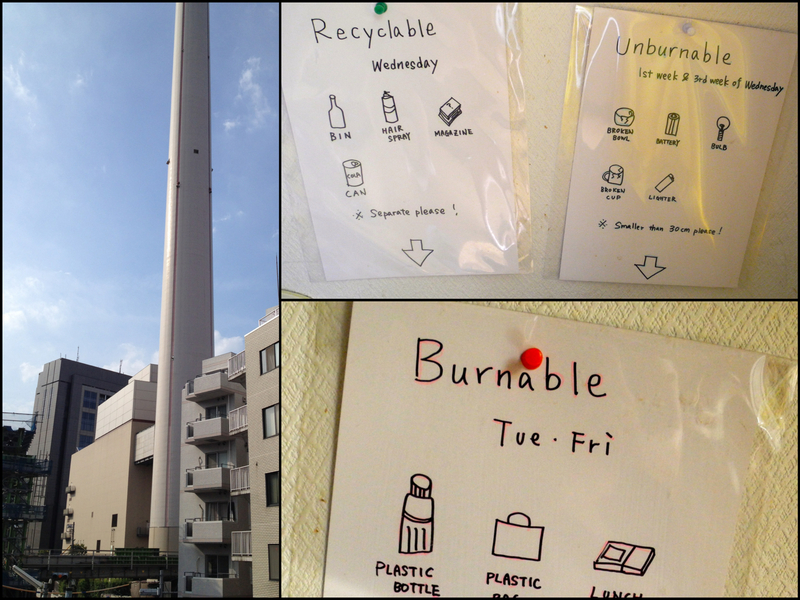 Where, you may be wondering, do they actually BURN the trash? It would appear that there is an incinerator just down the street from us. In fact, I can see it now from where I sit. Though this is obviously an environmental faux pas, what choice do they have really? They probably don’t have room for landfills…. They could recycle the plastics and I’m not sure why they don’t; they could cut down on packaging; they could eat fewer packaged foods. To be fair to the Japanese, they do have an awful lot of people to contend with and they do have some time-honoured traditions that are VERY eco-friendly. The bento box, for example, used to be made of lacquerware (now mostly plastic) and is re-used every day. A large cloth called a furoshiki is used to wrap up your lunch or other items. Children are often given a cloth napkin in their fabric lunch bag. Kimono are handed down for generations. I have confidence the Japanese will come up with a solution. 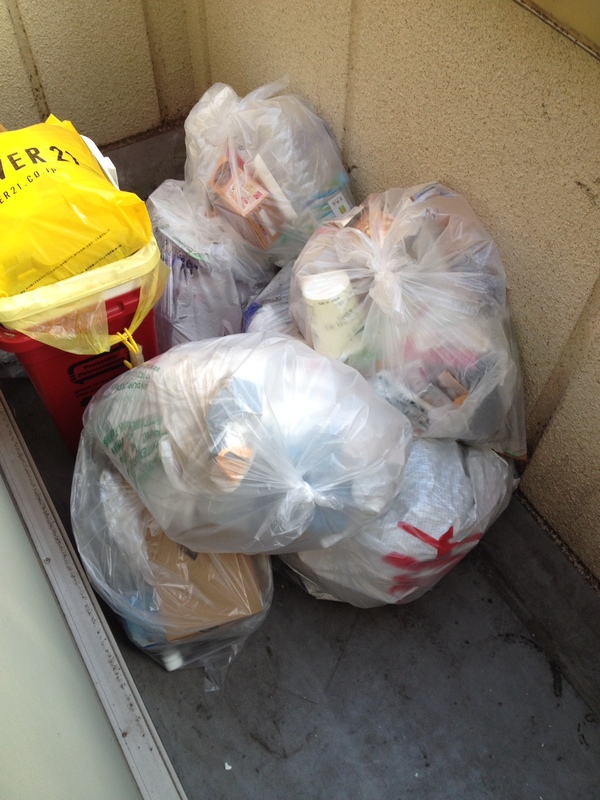 This pile is of our ‘burnables’ since Friday. That’s for four people, one of whom left on Sunday. Not big eaters and the girls eat our at least one mean per day so I imagine for a family it would be a lot more. 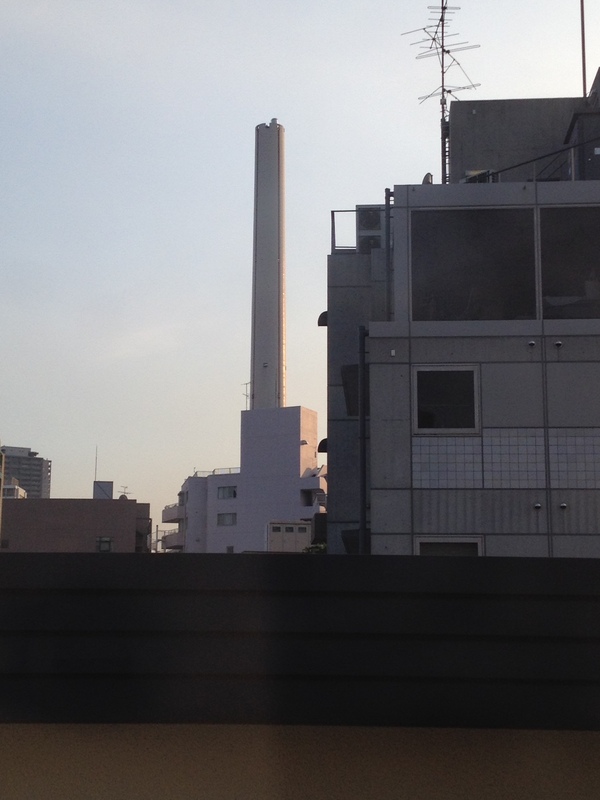 Note the lovely shot of the incinerator in the setting sun…they burn the garbage at night so as not to remind people….